Second album - recorded by The Jimi Hendrix Experience. This album was recorded in 1967, and released in the United Kingdom. Axis Bold As Love was a highly experimental album which can also be regarded a so-called psychadelic album. The themes of Hendrix childhood fantasies are all on the record. For instance his interest in science fiction which is evident in the introduction "Exp" and of course in "Up from the skies" in which he invites an alien for a friendly conversation. Hendrix his genius shines in the ballad "Little wing" in which he both refers to his American Indian heritage and to his mother who was very ill and in a wheelchair before she died. The typical British song "She's So Fine" was written by Noel Redding and somehow fits very well on the album. 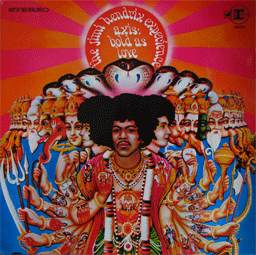 Hendrix apparently asked the production company to design a sleeve around his Indian roots, in the UK however the term Indian immediately reminded everybody of India which is the reason why the cover of the album has this great psychedelic design (not sure if Hendrix liked it). In later years Hendrix would have more misunderstandings about artwork on his albums.